There are 65 Assisted Living Facilities in the Hampton area, with 3 in Hampton and 62 nearby. The average cost of assisted living in Hampton is $2,563 per month. This is lower than the national median of $3,346. Cheaper nearby regions include Griffin with an average starting cost of $1,800. To help you with your search, browse the 248 reviews below for assisted living facilities in Hampton. On average, consumers rate assisted living in Hampton 4.4 out of 5 stars. Better rated regions include Fayetteville with an average rating of 4.7 out of 5 stars. Caring.com has helped thousands of families find high-quality senior care. To speak with one of our Family Advisors about assisted living options and costs in Hampton, call (855) 863-8283. Hampton is a small city in Georgia approximately 30 minutes south of Atlanta. Home to the Atlanta Motor Speedway and the 100-year-old-train depot, the city has many attractions for seniors. Hampton has a population of just over 7.700, with 9 percent over the age of 65. There are 61 assisted living facilities in the area, and three of those are within the city limits. Regulated by the Georgia Department of Community Health, assisted living facilities in Hampton include personal care homes with two or more residents and assisted living communities with 25 or more. The Hampton area has few facilities from which to choose in the event of a medical emergency or illness, with the nearest major hospital located in Stockbridge. Hampton has an array of community resources for seniors, including the Georgia Association of Area Agencies on Aging, an organization that aids with legal matters and helps match seniors with local resources, as well as one senior center. Henry County Transit provides curb-to-curb transportation at discount fares for adults 60 and older in Hampton to and from medical appointments, pharmacies, shopping centers and for social outings. Transportation services are available on a first-come basis, and all rides should be scheduled at least 24 hours in advance. Seniors have a one in 54 chance of becoming a victim of crime in Hampton. This is 34 percent lower than the national average, which makes the city relatively safe. The cost of living in Hampton is 102.5, which is slightly higher than the state and a national average of 100. This may pose a small challenge for seniors on a budget. Hampton experiences hot and humid summers and short, cold winters, which means it’s possible for seniors to enjoy the outdoors nearly year-round. Summer highs are around 89 degrees, while winter lows are around 32. The city only gets approximately two inches of snow per year. Assisted Living costs in Hampton start around $2,563 per month on average, while the nationwide average cost of assisted living is $4,000 per month, according to the latest figures from Genworth’s Cost of Care Survey. 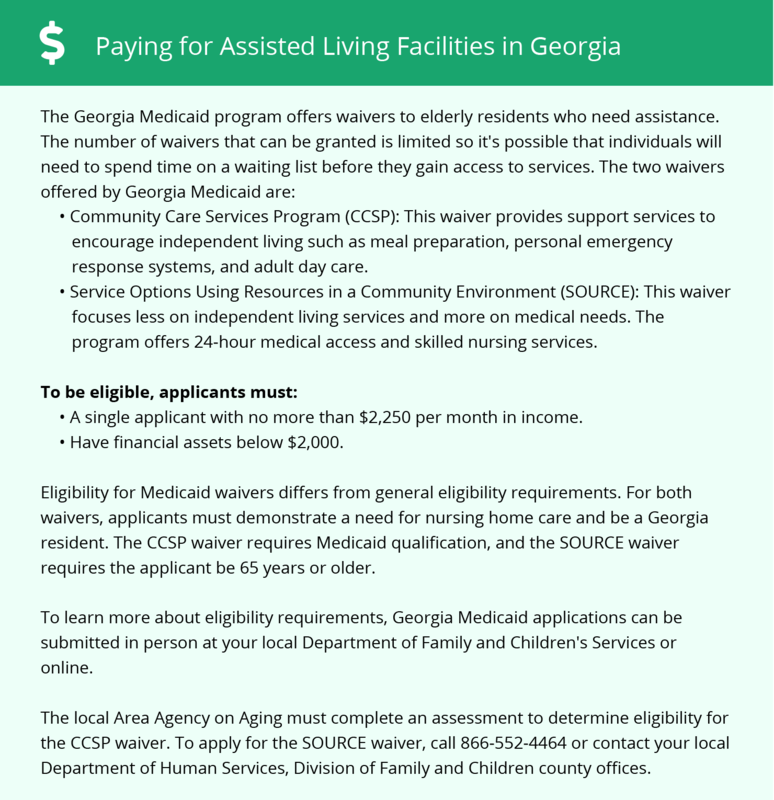 The Georgia State Medicaid waiver programs provide help for eligible seniors to pay for an assisted living home. The Georgia SOURCE waiver is available for individuals over the age of 65 or individuals with disabilities under the age of 65. The Community Care Services Program (CCSP) is for seniors 60 and older who qualify for Medicaid and need help with daily living tasks. Neither of these waivers includes payment for a private room or apartments, but they do allow for family supplementation. To see a list of free assisted living resources in Hampton, please visit our Assisted Living in Georgia page. Hampton-area assisted living communities must adhere to the comprehensive set of state laws and regulations that all assisted living communities in Georgia are required to follow. Visit our Assisted Living in Georgia page for more information about these laws.